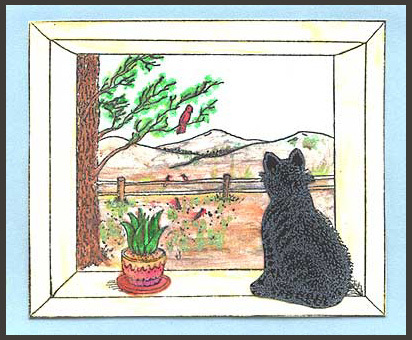 “Cat in Scenic Window” was embossed in detail black on white card stock and colored with “Rub-Ons.” A second image of the cat was stamped on black velvet paper with white Brilliance ink, cut out and mounted on the frame. The frame was highlighted with gold “Rub-Ons.” Crystal Lacquer was applied to the Aloe Vera plant as well as the birds, fence and grass. Card by Patty Tamler. “Zuni Pot, Lg.” is stamped with a tinted embossing pad on burgundy, tan and white card stock, embossed with Adirondack Embossing powders which are richly pigmented. Background paper is glued to burgundy card stock which is layered onto dark green card stock to which the cut out pots are glued and layered one over the other. A gold “Best Wishes” sticker is placed on the background paper. Dragonfly and gecko charms are attached several places on the card. Card by Patty Tamler. Tags: Charms, Embossed, Patty Tamler, Zuni Pot Lg. 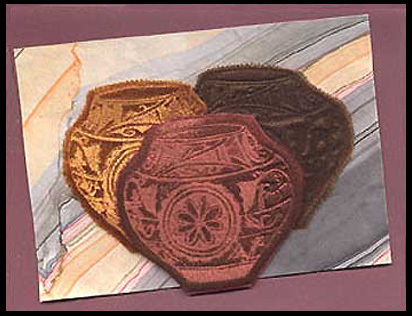 “Zuni Pot, Lg.” is heat embossed on three different colors of velvet, cut out and mounted on foam dots over handmade paper that is layered on burgundy card stock. Card by Patty Tamler. 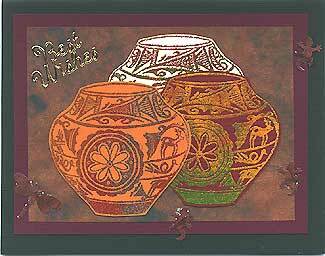 Tags: Embossed, Foam tape, Handmade Paper, Patty Tamler, Zuni Pot Lg. “Zuni Pot, Lg.” is stamped with a clear embossing pad on burgundy, tan and white card stock, embossed with Adirondack Embossing powders which are richly pigmented. Scrapbook paper is glued to burgundy card stock and the pots are cut out and glued to it with the feathers inserted into the top of the pots and glued behind them so as to appear to be in the pots. Four silver buttons are glued on the scrapbook paper. Card by Patty Tamler. 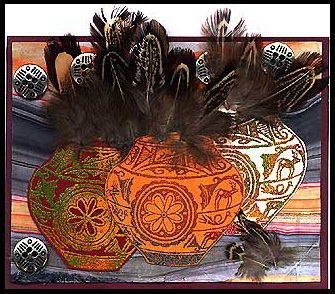 Tags: Buttons, Embossed, Feathers, Patty Tamler, Scrapbook Paper, Zuni Pot Lg.